Today’s awardee for 2013 Nobel Prize in Physiology or Medicine, James Rothman, hopes it will help him secure funds for the research for which he won the prize. The winners’ discoveries in the 1970s, ’80s and ’90s have helped doctors diagnose a severe form of epilepsy and immune deficiency diseases in children, Hansson said. In the future, scientists hope the research could lead to medicines against more common types of epilepsy, diabetes and other metabolism deficiencies, he added. In the 1970s, Schekman discovered a set of genes that were required for vesicle transport, while Rothman revealed in the 1980s and 1990s how vesicles delivered their cargo to the right places. Also in the ’90s, Sudhof identified the machinery that controls when vesicles release chemical messengers from one brain cell that let it communicate with another. Stanford researchers have designed the fastest, most accurate mathematical algorithm yet for brain-implantable prosthetic systems that can help disabled people maneuver computer cursors with their thoughts. The algorithm’s speed, accuracy and natural movement approach those of a real arm. On each side of the screen, a monkey moves a cursor with its thoughts, using the cursor to make contact with the colored ball. On the left, the monkey’s thoughts are decoded with the use of a mathematical algorithm known as Velocity. On the right, the monkey’s thoughts are decoded with a new algorithm known as ReFITT, with better results. The ReFIT system helps the monkey to click on 21 targets in 21 seconds, as opposed to just 10 clicks with the older system. When a paralyzed person imagines moving a limb, cells in the part of the brain that controls movement activate, as if trying to make the immobile limb work again. Despite a neurological injury or disease that has severed the pathway between brain and muscle, the region where the signals originate remains intact and functional. In recent years, neuroscientists and neuroengineers working in prosthetics have begun to develop brain-implantable sensors that can measure signals from individual neurons. After those signals have been decoded through a mathematical algorithm, they can be used to control the movement of a cursor on a computer screen – in essence, the cursor is controlled by thoughts. The work is part of a field known as neural prosthetics. A team of Stanford researchers have now developed a new algorithm, known as ReFIT, that vastly improves the speed and accuracy of neural prosthetics that control computer cursors. The results were published Nov. 18 in the journal Nature Neuroscience in a paper by Krishna Shenoy, a professor of electrical engineering, bioengineering and neurobiology at Stanford, and a team led by research associate Dr. Vikash Gilja and bioengineering doctoral candidate Paul Nuyujukian. In side-by-side demonstrations with rhesus monkeys, cursors controlled by the new algorithm doubled the performance of existing systems and approached performance of the monkey’s actual arm in controlling the cursor. Better yet, more than four years after implantation, the new system is still going strong, while previous systems have seen a steady decline in performance over time. “These findings could lead to greatly improved prosthetic system performance and robustness in paralyzed people, which we are actively pursuing as part of the FDA Phase-I BrainGate2 clinical trial here at Stanford,” said Shenoy. The system relies on a sensor implanted into the brain, which records “action potentials” in neural activity from an array of electrode sensors and sends data to a computer. The frequency with which action potentials are generated provides the computer important information about the direction and speed of the user’s intended movement. The ReFIT algorithm that decodes these signals represents a departure from earlier models. In most neural prosthetics research, scientists have recorded brain activity while the subject moves or imagines moving an arm, analyzing the data after the fact. “Quite a bit of the work in neural prosthetics has focused on this sort of offline reconstruction,” said Gilja, the first author of the paper. The Stanford team wanted to understand how the system worked “online,” under closed-loop control conditions in which the computer analyzes and implements visual feedback gathered in real time as the monkey neurally controls the cursor toward an onscreen target. The system is able to make adjustments on the fly when guiding the cursor to a target, just as a hand and eye would work in tandem to move a mouse-cursor onto an icon on a computer desktop. If the cursor were straying too far to the left, for instance, the user likely adjusts the imagined movements to redirect the cursor to the right. The team designed the system to learn from the user’s corrective movements, allowing the cursor to move more precisely than it could in earlier prosthetics. To test the new system, the team gave monkeys the task of mentally directing a cursor to a target – an onscreen dot – and holding the cursor there for half a second. ReFIT performed vastly better than previous technology in terms of both speed and accuracy. The path of the cursor from the starting point to the target was straighter and it reached the target twice as quickly as earlier systems, achieving 75 to 85 percent of the speed of the monkey’s arm. “This paper reports very exciting innovations in closed-loop decoding for brain-machine interfaces. These innovations should lead to a significant boost in the control of neuroprosthetic devices and increase the clinical viability of this technology,” said Jose Carmena, an associate professor of electrical engineering and neuroscience at the University of California-Berkeley. Critical to ReFIT’s time-to-target improvement was its superior ability to stop the cursor. While the old model’s cursor reached the target almost as fast as ReFIT, it often overshot the destination, requiring additional time and multiple passes to hold the target. The key to this efficiency was in the step-by-step calculation that transforms electrical signals from the brain into movements of the cursor onscreen. The team had a unique way of “training” the algorithm about movement. When the monkey used his arm to move the cursor, the computer used signals from the implant to match the arm movements with neural activity. Next, the monkey simply thought about moving the cursor, and the computer translated that neural activity into onscreen movement of the cursor. The team then used the monkey’s brain activity to refine their algorithm, increasing its accuracy. The team introduced a second innovation in the way ReFIT encodes information about the position and velocity of the cursor. Gilja said that previous algorithms could interpret neural signals about either the cursor’s position or its velocity, but not both at once. ReFIT can do both, resulting in faster, cleaner movements of the cursor. Early research in neural prosthetics had the goal of understanding the brain and its systems more thoroughly, Gilja said, but he and his team wanted to build on this approach by taking a more pragmatic engineering perspective. “The core engineering goal is to achieve highest possible performance and robustness for a potential clinical device,” he said. To create such a responsive system, the team decided to abandon one of the traditional methods in neural prosthetics. Much of the existing research in this field has focused on differentiating among individual neurons in the brain. Importantly, such a detailed approach has allowed neuroscientists to create a detailed understanding of the individual neurons that control arm movement. But the individual neuron approach has its drawbacks, Gilja said. “From an engineering perspective, the process of isolating single neurons is difficult, due to minute physical movements between the electrode and nearby neurons, making it error prone,” he said. ReFIT focuses on small groups of neurons instead of single neurons. By abandoning the single-neuron approach, the team also reaped a surprising benefit: performance longevity. Neural implant systems that are fine-tuned to specific neurons degrade over time. It is a common belief in the field that after six months to a year they can no longer accurately interpret the brain’s intended movement. Gilja said the Stanford system is working very well more than four years later. “Despite great progress in brain-computer interfaces to control the movement of devices such as prosthetic limbs, we’ve been left so far with halting, jerky, Etch-a-Sketch-like movements. Dr. Shenoy’s study is a big step toward clinically useful brain-machine technology that has faster, smoother, more natural movements,” said James Gnadt, a program director in Systems and Cognitive Neuroscience at the National Institute of Neurological Disorders and Stroke, part of the National Institutes of Health. For the time being, the team has been focused on improving cursor movement rather than the creation of robotic limbs, but that is not out of the question, Gilja said. Near term, precise, accurate control of a cursor is a simplified task with enormous value for people with paralysis. “We think we have a good chance of giving them something very useful,” he said. The team is now translating these innovations to people with paralysis as part of a clinical trial. This research was funded by the Christopher and Dana Reeve Paralysis Foundation, the National Science Foundation, National Defense Science and Engineering Graduate Fellowships, Stanford Graduate Fellowships, Defense Advanced Research Projects Agency (“Revolutionizing Prosthetics” and “REPAIR”) and the National Institutes of Health (NINDS-CRCNS and Director’s Pioneer Award). Other contributing researchers include Cynthia Chestek, John Cunningham, Byron Yu, Joline Fan, Mark Churchland, Matthew Kaufman, Jonathan Kao and Stephen Ryu. Scientists say they’ve found the gene that sets the common tabby pattern – stripes or blotches. It’s one of several genes that collaborate to create the distinctive design of a cat’s coat, and it’s the first of the pattern genes to be identified. Cats with narrow stripes, the so-called “mackerel” pattern, have a working copy of the gene. But if a mutation turns the gene off, the cat ends up with the blotchy “classic” pattern, researchers reported online last week in the journal Science. It’s called “classic” because “cat lovers really like the blotched pattern,” said one of the authors, Greg Barsh. He works at both Stanford University and the HudsonAlpha Institute of Biotechnology in Huntsville, Ala. The research team, which included scientists from the National Cancer Institute, examined DNA from wild cats in California to identify the gene. 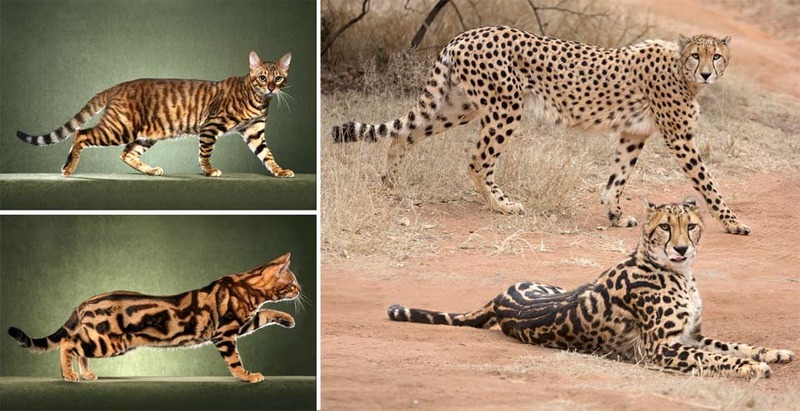 They also found that a mutation in the same gene produces the blotches and stripes of the rare “king” cheetah, rather than the spots most cheetahs have. Leslie Lyons, a cat geneticist who studies coat color traits at the University of California, Davis, but didn’t participate in the new work, agreed that the research has identified the tabby’s stripes-versus-blotches gene. She noted that mysteries remain, such as just what genetic machinery gives a tabby spots.